For decades man has striven to improve sanitation and protect production animals and crops from infectious agents to prevent diseases in humans, animals and plants. We tend to eat highly processed foods and many children grow up in almost sterile surroundings, for instance without contact to animals. Consequently, in developed parts of the world we are much less exposed to microorganisms and helminths than previously, and the extensive use of antibiotics for prevention, treatment and control of microorganisms is well-known. As we are now starting to get a much deeper understanding of the role of the human microbiome (whatever that is) in health and disease, we become aware that microbes are to a large extent beneficial to us; for instance we are currently realising that human health is more or less proportional to intestinal biodiversity, including colonisation by parasites. I have previously mentioned the intentional use of eggs of the parasite Trichuris suis to alleviate symptoms and maybe even reduce disease processes in inflammatory bowel disease, a disorder seemingly stemming from immunological processes out of balance. Also in the food sector, steps may now be taken to diminish breeding and gene manipulation to increase crop yield; instead manipulation of microbes (e.g endophytes) may be used to makes crops hardier. Using microbes to combat other microbes and disease processes, thereby reducing the use of antibiotics and other chemical compounds will probably - and hopefully - be central to controlling diseases and increasing production yields. For us in the 'Blasto business' these trends are particularly intriguing. I'm not the only one who just a couple of years ago thought that functional bowel disorders such as irritable bowel syndrome (IBS) to a large extent might be directly attributable to undiagnosed parasite infections (e.g. Blastocystis and Dientamoeba), something that could be supported by data going out from one of the studies that I carried out during my PhD studies. Over the years, however, we and other groups have produced data showing that patients with IBS are in fact significantly less colonised by the microbial eukaryotes Blastocystis and Dientamoeba than the healthy 'background' population (see this blog post). We also have access to metagenomic data that link the presence of these microbial eukaryotes with high bacterial diversity in the intestine, and I have colleagues confirming that patients suffering post infectious IBS-like symptoms do practically not harbour these parasites. Our hypothesis now is that - generally speaking - Blastocystis and Dientamoeba are proxies for high intestinal microbial diversity and thereby for a healthy gut ecology. This does of course not rule out the possibility of pathogenic strains/subtypes/whatever of microbial eukaryotes, and we are currently increasing our efforts to investigate whether these organisms can cause disease directly or indirectly, - I'll post a few lines on some of the work we have in mind for 2014 in my next post. I believe that one of the things that most Blastocystis researchers are interested in currently, is to increase our knowledge on the diversity and biological characteristics of mitochondrial and nuclear genomes. It takes time to produce, analyse and interpret genomic data on Blastocystis, simply because we have so little money that can be allocated to PhD students and post docs. Although we try hard to get funding, we only have one PhD student working with Blastocystis genome data... I could have wished for at least one more. One year ago, I thought that 2013 would see at least one more Blastocystis genome paper, but so far, only very little data have emerged and only included in conference abstracts. But so far it appears that the genetic universe of Blastocystis is even bigger than most of us may have thought! To get a very preliminary impression of their data and how much ST1 differs from ST7 (currently the only available genome), you may want to visit a previous blog post. This basically means that even though we know about genes present and expressed by one subtype, the situation may be completely different for other subtypes! Very interesting, but it also means that a lot of work remains to get a clear picture of what Blastocystis actually does and is capable of doing. This year was also the year where three seminal papers came out from London School of Hygiene and Tropical Medicine, all of them first authored by Dr Mohammed Alfellani, who did a magnificent job collecting, culturing and 'DNA extracting' samples from both humans, non-human primates, and other animals from various geographic regions. I have already given numerous examples of his findings. Dr Alfellani identified new subtypes, and did a great job in identifying remarkable variations in the geographical distribution of subtypes in both humans and animals. There are also some useful tables in Alfellani's papers showing overviews of molecular data produced by him and our colleagues. We definitely hope that his papers will stimulate other colleagues to pursuing the epidemiology of Blastocystis and should definitely hold some useful tools for those who are new to Blastocystis epidemiology research. I had the pleasure to write up a paper to Trends in Parasitology together with Dr Pauline Scanlan. The paper was free for download in November, and we received quite a lot of positive feedback, so thank you all who are so supportive of the work! It was also very rewarding to put together a review for Advances in Parasitology together with Drs Alfellani, van der Giezen and Clark on 'Recent Developments in Blastocystis Research'. 2013 was also the year where my SSI colleagues and I published a comment in the ISME Journal on how impatiently we are awaiting data on the human 'eukaryotic' microbiome. To map the microbial eukaryotes of the intestine and to try and characterise their structure and function and the intestinal ecology that accompany these organisms are activities that should receive top priority in my opinion. There is a link to the comment here. Congress-wise, I experienced my first-time-ever Blastocystis session at a conference! It was at the merged meeting arranged by the Scandinavian-Baltic Society for Parasitology and the European Society for Tropical Medicine & International Health. Next year, I will be involved in the session 'Passion for Parasites' at the general ASM 2014 meeting in Boston (morning session,18th of May 2014), where I'll be giving a talk on Blastocystis, and, later next year, I will also be leading a lecture/workshop associated with the ICOPA conference in Mexico on Blastocystis barcoding, - I hope to see a few upcoming Blastocystis geeks there! I don't think we have ever had better opportunities to do significant research on Blastocystis. More and more people are working with it, our epidemiological data have become a lot stronger, enabling more subtle hypotheses, lots of strains have been sequenced, we have developed protocols for experimental in-vitro and in-vivo studies, so here's to hoping for a vast increase in funding and work in 2014! 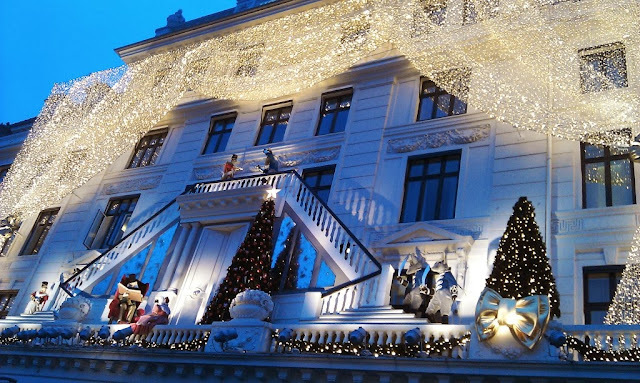 Attaching an image of the Nutcracker display currently adorning the facade of the Hotel d'Angleterre in Copenhagen, I wish all of the readers of this blog a Merry Christmas and a Happy New Year!